Do you want to know how to get to the nami island? There are many ways you can get to nami island such as public transportation (bus, subway / metro), taxi and Blacklink limo/transfer/shuttle service. Don't sweat outside waiting for other transportation with your luggage. Make a round trip reservation with Blacklink as you plan for your trip. It is easy, convenient and available 24/7. Then, the assigned Blacklink driver will greet you at the arrival and will drive you to the nami island. You can use Blacklink for not only hotel but also Gimpo Airport (GMP), Myeongdong, Jongno-gu, guesthouse, resort, airbnb, lodging and anywhere you want to go in Korea. Check out Blacklink customer review posted below. Nami Island is an oasis for culture and leisure in peaceful harmony with humanity and nature. After a five-minute ferry ride, guests meet a forest of verdant trees holding up the sky and open grassy areas where ostriches, rabbits, squirrels, chipmunks, ducks and peacocks warmly welcome visitors in the midst of wild flowers. On Nami Island, artists from all over the world show-off their talents and share the sense of peace of mind the island creates. 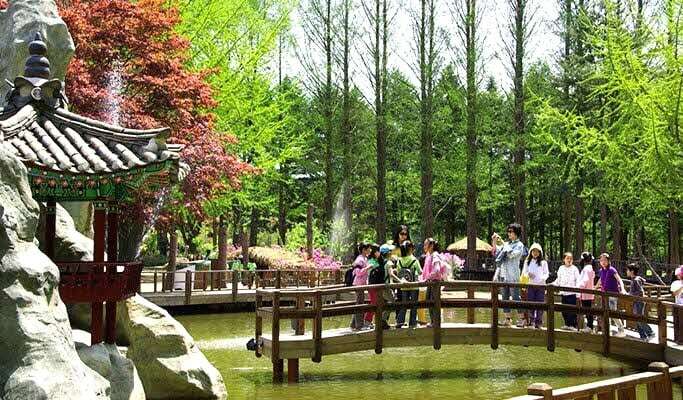 The island is the site of Nami Island International Children's Book Festival (NAMBOOK) and other cultural events that take place every weekend, making Nami one of the main cultural and artistic tourist attractions in Korea. 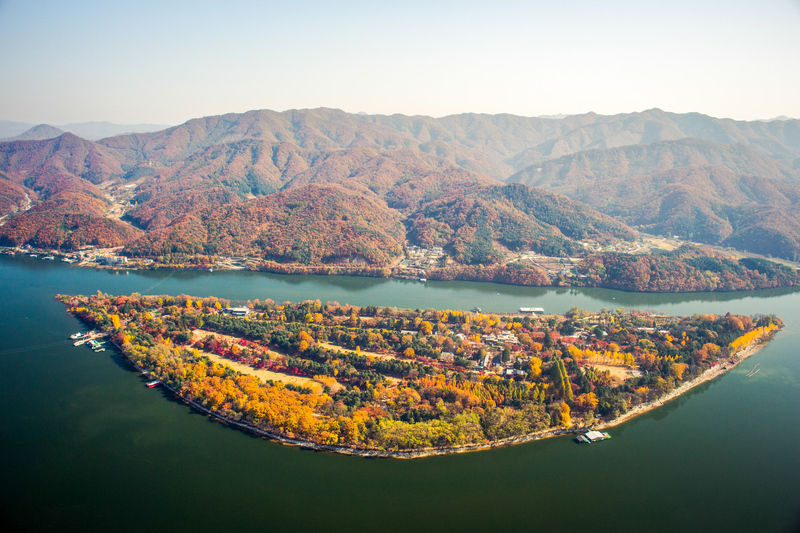 In 2006, Nami Island declared its cultural independence and was reborn as Naminara Republic. It has its own national flag, anthem, currency, passport and phone cards, stamps, orthography and even a certification of citizenship. Nami is home to several galleries and is the site of the Song Museum, which also houses a collection of international ethnic musical instruments(liuseum). There are indoor and outdoor stages, facilities for seminars and workshops in addition to a 46-room Naminara national hotel and 10 cottages. Nami Island is dedicated to improving the mental and physical well being of children throughout the world. As such, it serves as the main sponsor of the Hans Christian Andersen Award and contributes regularly to UNICEF. Since 2013 it has sponsored the Nami Island International Picture Book Illustration Concours. Naminara is unique in other ways, also. At night, all the lights are turned off on the island so that visitors can harmonize with nature under the light of the moon and stars. Most of the paper waste and bottles used by visitors to the island are recycled and re-used. Naminara has a very open hiring and retirement policy so people can work until they are 80 years old if they wish. 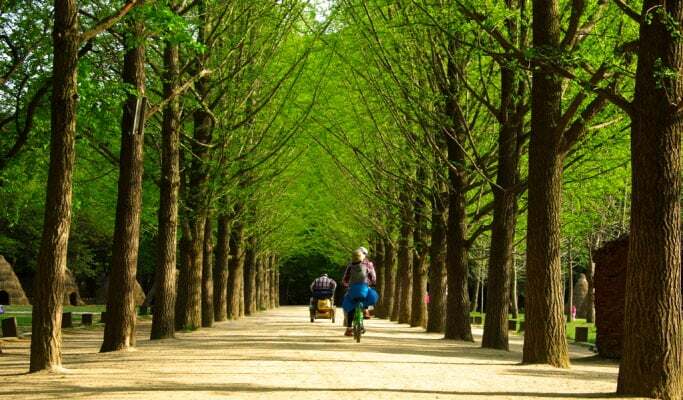 The island, especially the Metasequoia path, was one of the main filming locations of the Korean Broadcasting System 2002 television drama series Winter Sonata, starring Bae Yong-joon and Choi Ji-woo. It attracted 270,000 Korean and foreign visitors in 2001. After it was featured in the drama, it attracted 650,000 visitors in 2002. Since then the number of visitors has continued to grow, reaching 2.3 million in 2012 and 3 million in 2014.